Over the weekend, I (and several other members of CityLIS) took part in two annual Fun Palaces events held in the Barbican Library and Clapham Library. The Fun Palaces initiative aims to, in the words of its organisers, facilitate “free, welcoming annual events combining arts and sciences, made for and with local people”. As such, it represents a wonderful opportunity for public libraries to promote themselves as community centres by hosting these events, within the ongoing repurposing of the institution itself as a dynamic social space for activities, collaboration and engagement, rather than merely a repository of physical items. This is particularly important in this country right now due to the current government’s continuing policy of austerity, which is threatening the effectiveness, and even the future, of many public libraries. City University London was involved in organising two events this year, both of which were guided by professional public events creator Matt Finch. The first, which I helped out with during the morning at the Barbican, was a guide to serendipity in the library run by Stephann Makri, who specialises in Human-Computer Interaction; the second, held in Clapham and to which I defected after lunch, was a zine-making workshop led by the already oft-mentioned Ernesto Priego, whose research interests include the relevant areas comics and publishing. Dr Makri’s research into serendipity is rooted in the age-old library (amongst others…) problem of how to effectively retrieve information. He and other academics have noted that library users often find information serendipitously—by chance, with a positive outcome—due to the simple fact that it exists in a physical form and must be laid out in a physical space. This means that a person looking for a specific book will see other books whilst navigating the library shelves, and will be able to form connections easily between them and their initial area of interest. By contrast, electronic information retrieval relies on ever more-precise algorithms to return only the most specific results; the overwhelmingly vast majority of electronic, online documents remaining invisible unless specifically searched for, hence reducing the possibility for serendipity. The serendipity event involved Dr Makri giving a short presentation on the subject to the participants (as with all the Fun Palaces events, willing members of the public who were visiting the library), followed by a practical exercise in utilising various “serendipity strategies” to find new and interesting books on the library shelves. The subjects carried this out with aplomb, finding books that interested them in new areas of the library that they had not previously thought to explore, and also contributing their own techniques which they already used to encourage serendipity (even if they were previously unaware of it as a subject of serious academic research) to the project’s bank of data. The second workshop, in Clapham, was completely different but no less related to issues affecting libraries. Under the leadership of Dr Priego, we encouraged children to make their own “zines” (short for fanzines)—a self-made publication collated from repurposed texts and images on a subject of the creator’s interest. To facilitate this, we provided a stack of recent newspapers to cut up and reassemble, in addition to access to the Internet, from which further items of interest could be printed. The finished zines were then photocopied using library facilities to encourage further dissemination. The subjects of the zines made by the participating children included Chelsea F.C., information technology and luxury houses. The CityLIS people helping to run the event also made their own examples; mine was on the subject of cars and motorsport (above). The experience reminded me not only of my own childhood of undertaking similar projects, but more generally of a time before ubiquitous access to and use of the Web, when the creation and exchange of fan-made content had to be carried out without the benefit of computer programmes or social networks. All in all, the Fun Palaces events made for an interesting and rewarding Saturday. After a year spent studying the theories, technologies and issues surrounding library science in a classroom environment, and working in an academic library, it was particularly beneficial for me to spend the day experiencing life in two public libraries, and how the subjects we have studied can have considerable practical significance in the real world. Last weekend, I afforded myself some relief from the arduous processes of dissertation-writing and job-hunting with a short trip into deepest Wallonia. The pleasant Belgian town of Mons, a European Capital of Culture this year, is host to a number of museums, galleries and historic buildings, including the Mundaneum—the remains of Paul Otlet’s utopian project to create a world city underpinned by the free and direct access to, and dissemination of, information presented in a museum that showcases his life’s work. Although this visit was not strictly necessary to support my dissertation, as the resources that I require are all available either online or through the British Library, it was nevertheless fascinating to see original copies of many of Otlet’s explanatory posters and graphics, and of course numerous sections of the Répertoire bibliographique universel—Otlet’s enormous card-catalogue index of bibliographic references. I also had some productive discussions on a number of subjects with three like-minded individuals who were also visiting the museum. 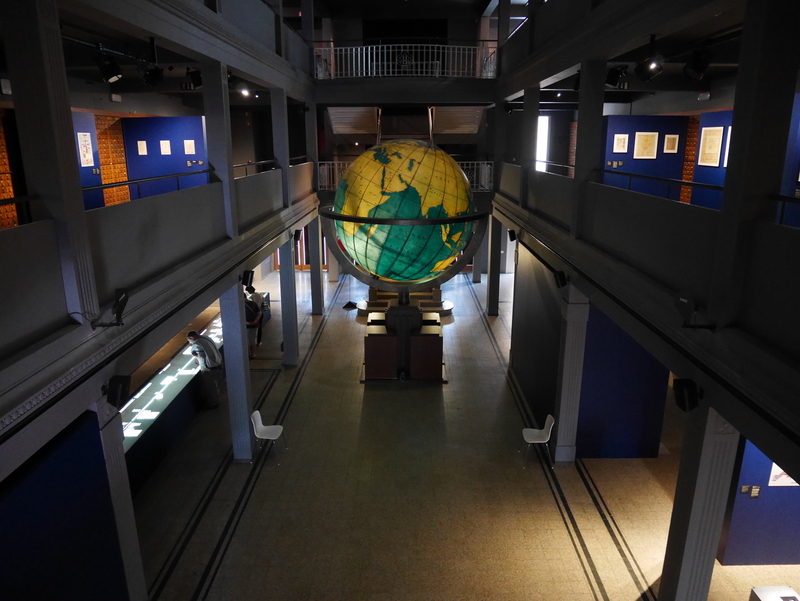 The Mundaneum’s central atrium; the universality of the project is indicated by the prominent globe. The Mundaneum’s exhibits are spread across three floors, illuminated just to the level of hushed reverence. 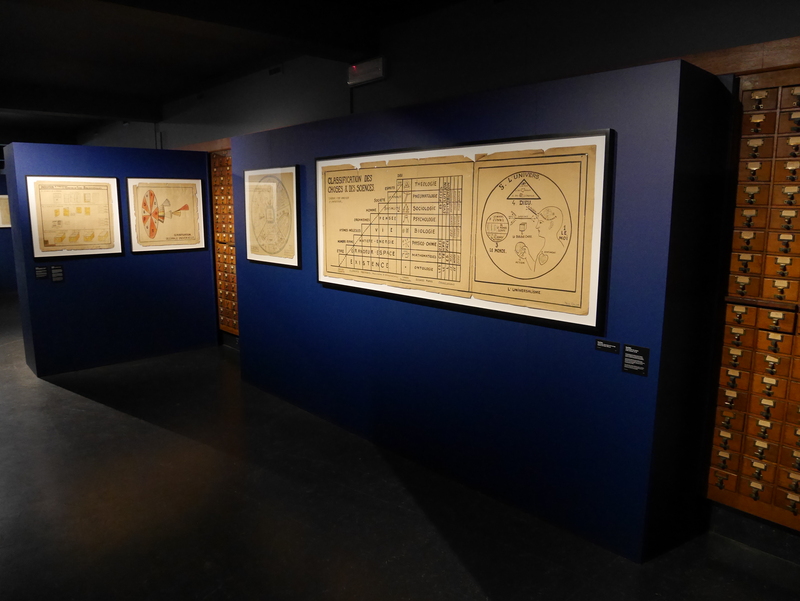 The displays consist of sections of the catalogue and selections of Otlet’s drawings on various subjects (which are also available online through the Google Cultural Institute; Google operates one of its data centres nearby), not just limited to library and information science, but also including works on network theory, the nature of international associations, pacifism, and utopian visions of his never-realised World City. 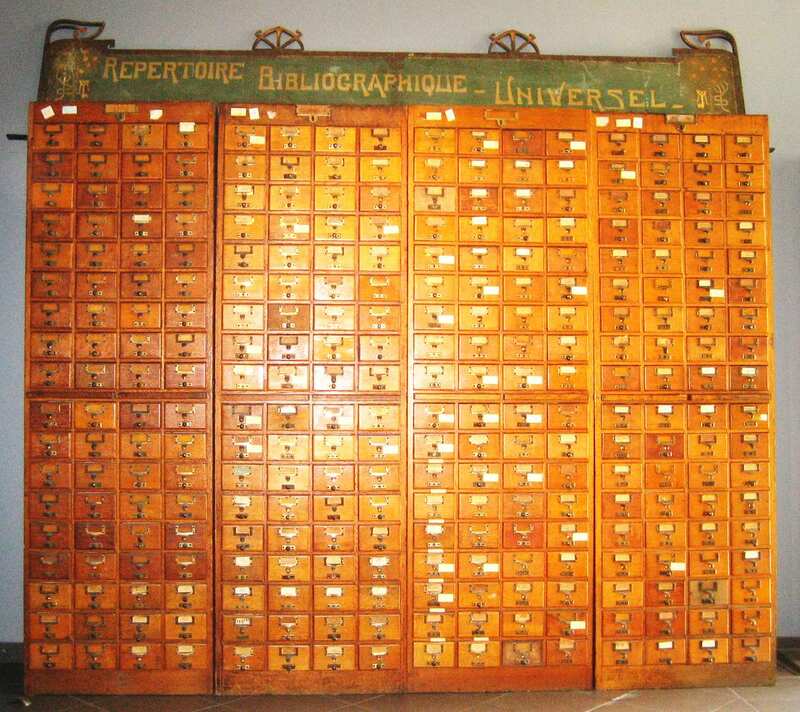 A large section of the Répertoire bibliographique universel. 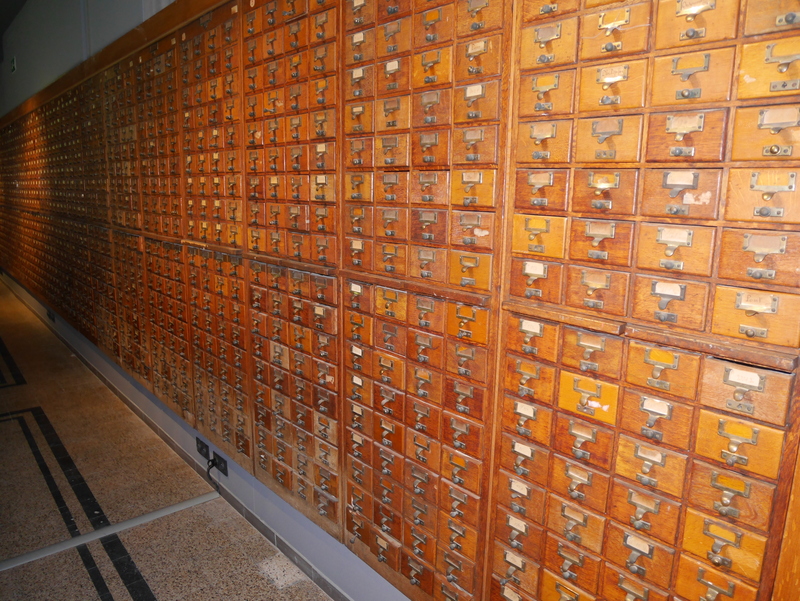 Perhaps surprisingly, each individual drawer can be opened to reveal its original contents. Sections of the RBU are juxtaposed with examples of Otlet’s graphical output. Of particular interest to my research into predictions of future information technology was a full-scale realisation of Otlet’s Mondothèque, an analogue anticipation of the digital desktop computer. Otlet’s original drawing is framed above the modern construction. Otlet’s work is also placed in its historical context by the display of previous attempts to organise human knowledge—some of which I referred to in this previous blog post on the history of encyclopaedias—in addition to a timeline that charts advances in statistics and abstract forms of data visualisation, as people have sort to record knowledge in ever-more accurate, intuitive ways. Can you see the central black grain? This exhibit reminded me greatly of scale models of the Solar System, and in my experience the vast emptiness of space is as similarly difficult to comprehend as the current information explosion, which philosopher of information Luciano Floridi has characterised as “The Fourth Revolution“, comparable to the advances in human understanding achieved by Copernicus, Darwin and Freud. All in all, the Mundaneum was an extremely interesting place to visit, and I would thoroughly recommend a trip to Mons to anyone interested in the subject. 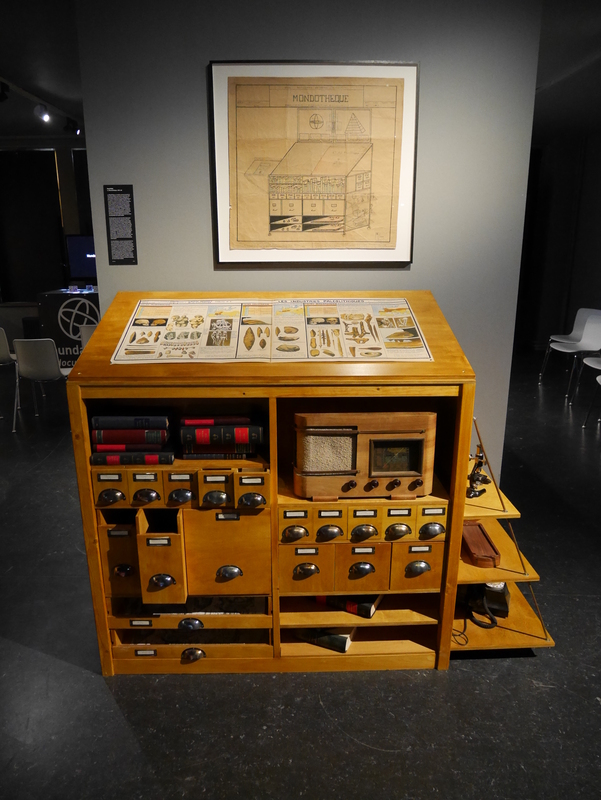 Paul Otlet lives on, almost literally, through his work and writings. …as does his close friend and long-term collaborator, Henri La Fontaine. Now that the taught part of my MSc in Library Science is complete (final grades permitting), there is nothing between me and the qualification save for the small matter of the dissertation—an extended piece of original research, ideally spanning between 15,000 and 20,000 words. Looking through the course’s repository of past projects (and that of the sister MSc in Information Science) has been an enjoyable and illuminating experience, with extreme diversity in evidence. Previous studies—and the ideas that I have discussed with my current coursemates—cover every conceivable aspect of the subject, from explorations of the theory of information itself, information provision in certain periods and locations in history, the social and political roles of libraries in modern society, through to practical studies into a particular aspect of the contemporary library service. (Literally as I have been writing this blog post, David Bawden, who oversees the dissertations, has helpfully provided a fuller list of examples, including my own!) I have decided upon my topic by the simple expedient of expanding upon the aspect of the course which I have enjoyed the most (in an effort to keep myself sane until the hand-in time of late September! ): the predictions of future library and information service technologies made by pioneering figures in the profession’s past, an interest which was first sparked by reading Charles Ammi Cutter’s essay, The Buffalo Public Library in 1983 during the year before I embarked upon the course. After initially thinking about an extremely wide-ranging project, including aspects such as science fiction and popular perceptions of libraries, I came across the article The Future of the Web is 100 Years Old by Alex Wright, author of a recent biography of Paul Otlet, the Belgian documentalist and bibliographer who is probably best-known for devising the Universal Decimal Classification system, which contrasted how the ideas of Otlet and Vannevar Bush, the American computer engineer and scientific administrator, famous for his seminal essay As We May Think, have influenced the development of the modern Internet. Searching the literature, I discovered a sizable (but not overwhelming!) body of research that has been conducted into the work of these two men—and also that of the writer and political activist, H.G. Wells—and how their predictions of future information technology, featuring many extremely perceptive and accurate observations, can collectively be defined as a sort of “proto-” or “analogue” Internet, and have experienced something of a revival of late as the Digital Internet itself has become ubiquitous over the last twenty years, and perhaps also because of the contemporaneous development of the steampunk genre in literature. 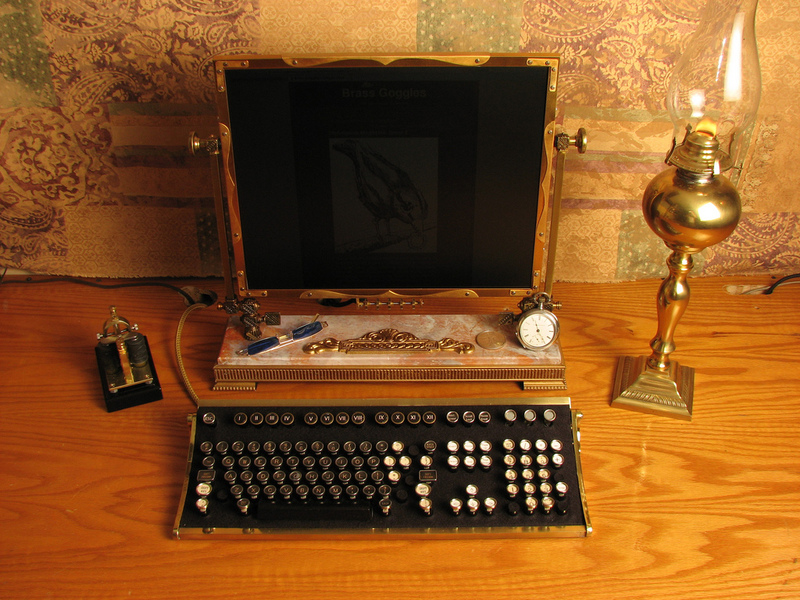 A current revival of interest in historic ICT predictions may be symptomatic of a wider fascination with the “steampunk” genre, which habitually blends the contemporary with the antiquated. The working title of my dissertation is therefore “Anticipating the Internet: how the predictions of Paul Otlet, H.G. Wells and Vannevar Bush have shaped the Digital Information Age”. A happy Paul Otlet doing what he did best. 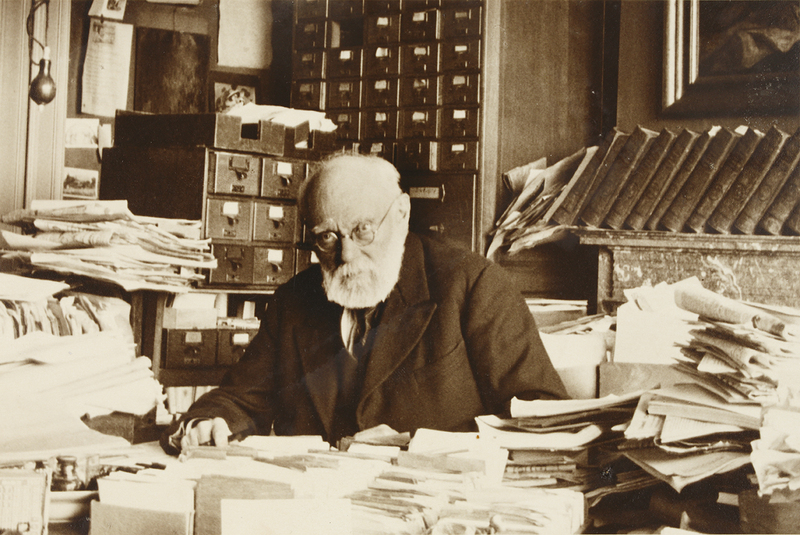 Paul Otlet (1868–1944) was a Belgian visionary who believed that controlled, standardised bibliography was the key to the advancement of human knowledge. 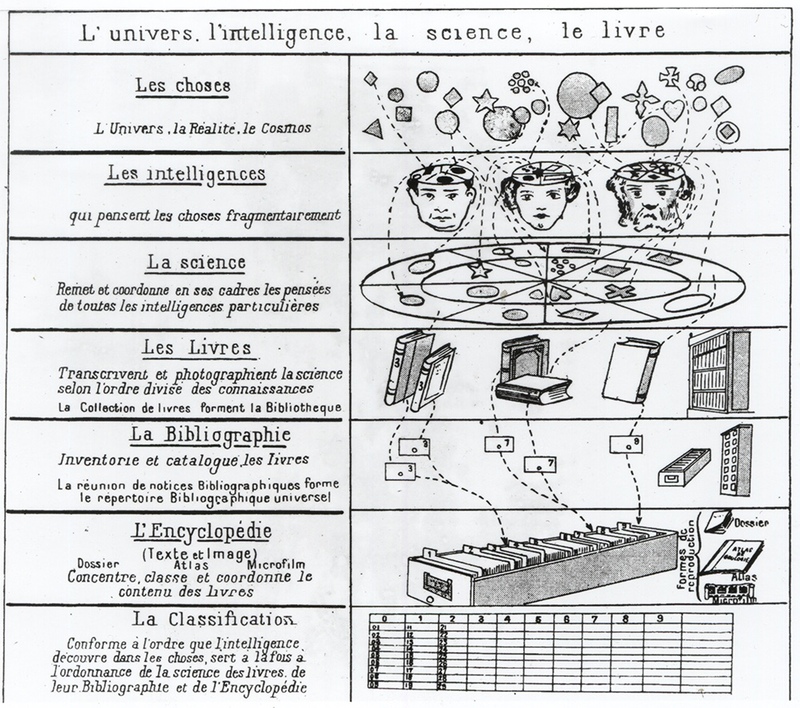 His drawing below illustrates his theory of knowledge: facts and observances about the universe are parsed through human brains to create academic disciplines and fields of study which are then codified in books and other written information sources, ultimately forming a library of information. 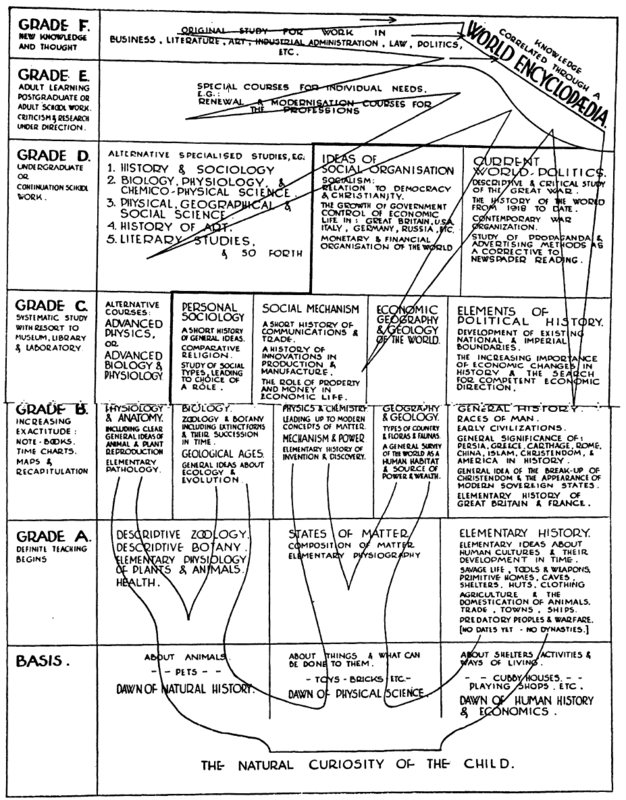 Paul Otlet’s conceptual model of how human knowledge is recorded. The universal catalogue transcends the limitations of individual books and other physical “carriers” of information. However, the book itself as a repository or “carrier” of information is only as effective as the bibliographic tools that are used to locate the information therein: hence the additional stages of creating a bibliographic index and control, a universal encyclopedia (based on a card-catalogue index), and a classification system (UDC) to organise and map the knowledge produced in this way. Otlet’s goal of building a fully-functional Mundaneum transcended the “mere” creation of a comprehensive world encyclopaedia, however, and extended towards creating a new “World City” with a complex of libraries and museums at its heart, all of which would be disseminated by networked technology created by the development and synthesis of then-current technology, and facilitated through the efforts of international organisations such as Otlet’s own International Institute of Bibliography (IIB)—now The International Federation for Information and Documentation (FID)—sadly stymied in turn by the successive outbreaks of two World Wars and the associated tension in between, which destroyed the Belle Époque ideals with which Otlet grew up. He also envisioned ICTs that foreshadow real devices that were currently developed, whilst his organising ideals have been preserved in current projects such as the Semantic Web. However, the comparatively anarchic and free-form nature of Wikipedia, perhaps the nearest thing to a spiritual successor of the Mundaneum, would likely have horrified Otlet, who favoured a top-down approach to information controlled by renowned experts. 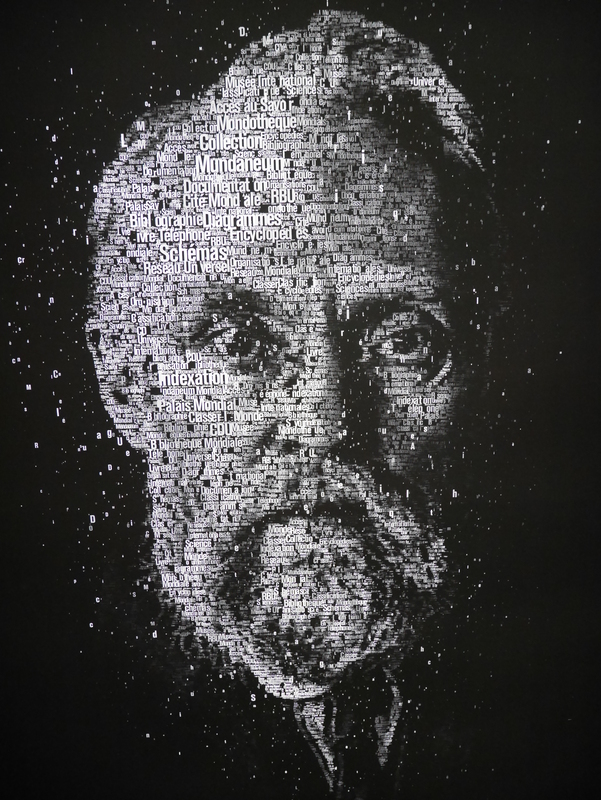 Otlet envisaged the synthesis of different forms of (at the time) emergent technology, anticipating the conference call and the potential for the networked dissemination of information. 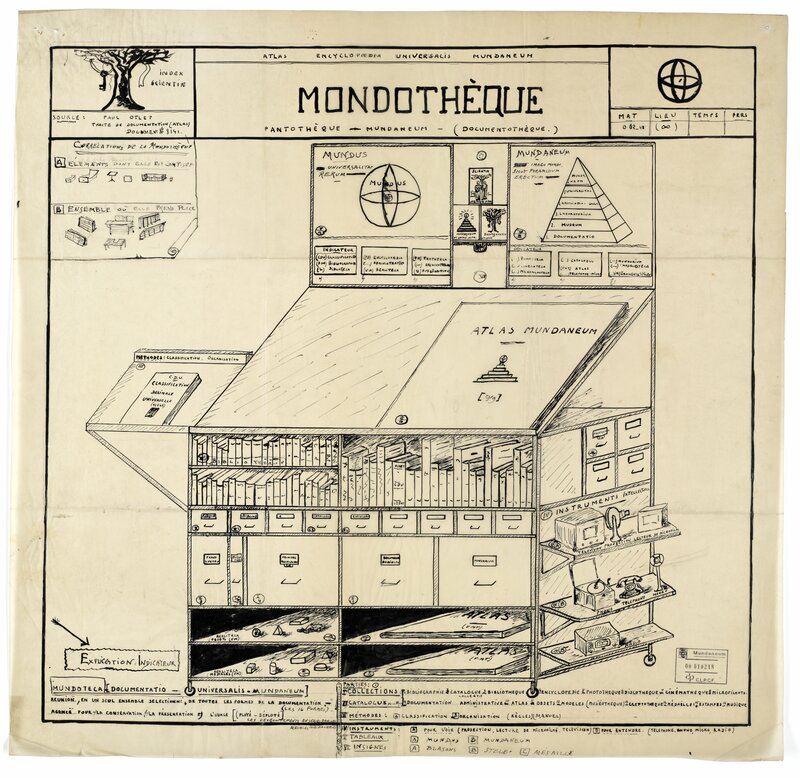 He also sketched the Mondothèque—a “scholar’s workstation” with multimedia capabilities. H.G. Wells, probably thinking about aliens, time travel, or…information retrieval? 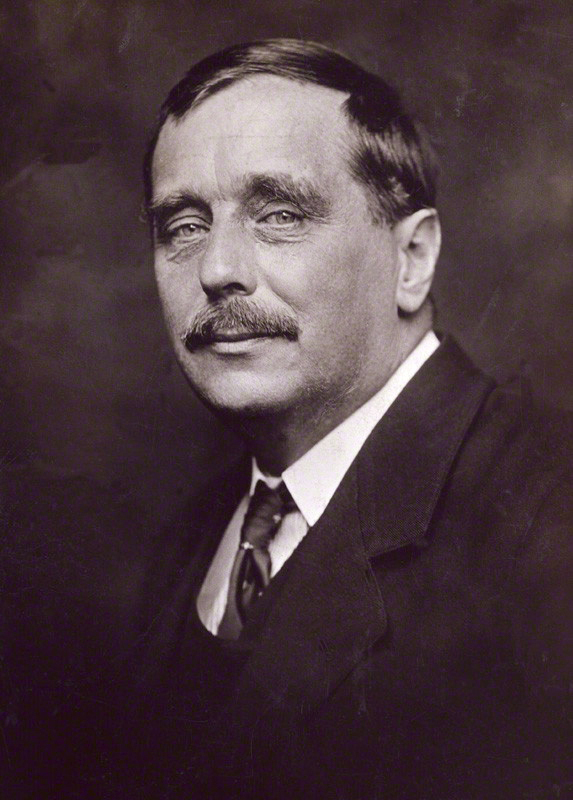 Herbert George (H.G.) Wells (1866—1946) was a contemporary of Otlet, and the two were certainly aware of each other’s work. Wells was a prolific writer of non-fiction works and political activist in addition to authoring his bestselling science-fiction novels. Something of an idealist like Otlet, he too became aware and frustrated with the limitations of existing technology, and envisaged a “World Brain” of knowledge to fulfil the same function as Otlet’s Mundaneum. 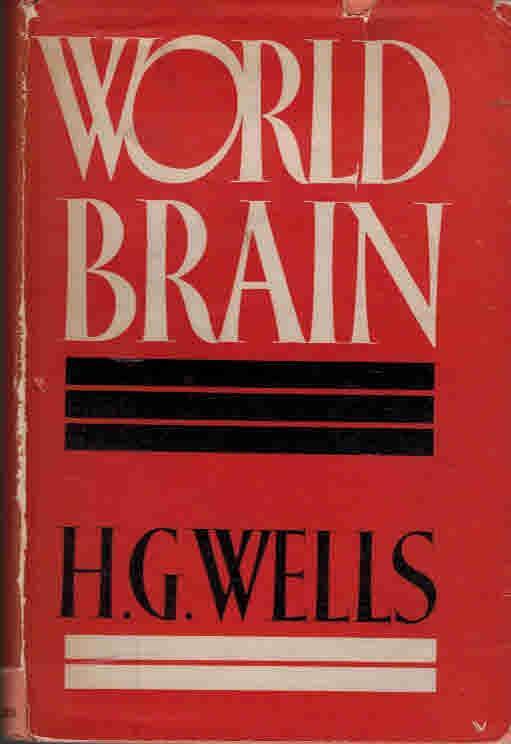 Cover of the first edition of World Brain, a collection of essays by Wells on the subject. Wells was a passionate believer in the progression of scientific and academic knowledge as a means of improving society, viewing—in a continuation of his biological analogy—that existing political and economic structures were “diseased”, and that a new “network of nerves” of knowledge must be constructed to remodel society. In contrast to Otlet, his overtly political stance and apparent acceptance of a high degree of authoritarianism in order to achieve a functioning World Brain has resulted in his ideas attracting attention for what one might call the “wrong” reasons: government collection and control of information, surveillance, and, latterly, comparisons to the growth of technical monoliths such as Google. His advocacy of a single user authentication for the system has also influenced debates on the subject of individual privacy and security on the modern Internet, which notoriously lacks such a feature. Wells’s schema for education using the World Brain. 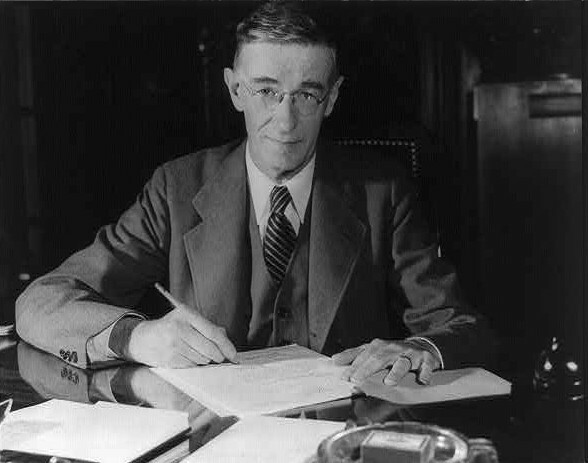 Vannevar Bush—hard at work, but also a talented self-publicist. Vannevar Bush (1890—1974) was a generation younger than Otlet or Wells, and his predictions benefit from both their work (and that of other contemporary figures) and the fact that digital computers and the forerunner of the modern Internet were becoming practical realities during his time of writing (As We May Think was published in 1945). He was also a qualified engineer and experienced scientific administrator within the United States—serving as chairman of the National Defense Research Committee and the Office of Scientific Research and Development, and playing a leading role in the National Science Foundation, giving him the strongest practical background for envisioning what future information technology might come to be like. In his essay, Bush introduced his pet project, the Memex (short for Memory Extender): a personalised cabinet that could produce personalised “memory trails” of related information using an array of microfilm. It has often referred to as the conceptual forerunner of hypertext, which allows modern Internet users to do much the same thing. 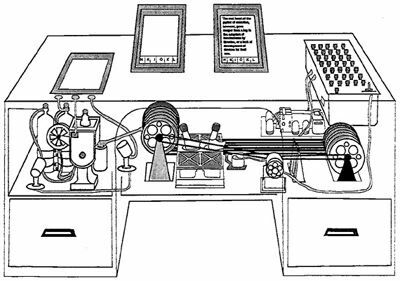 A diagram of Bush’s Memex. Note the conceptual similarity to Otlet’s earlier work. The main conceptual difference between the Memex and the similar ideas proposed by Otlet and Wells is that it was intended to be a highly personal form of technology, for use by the advanced research scholar or professional, as opposed to the latter pair’s grandiose schemes of improving universal knowledge through the creation of an all-encompassing information infrastructure. Perhaps surprisingly, the utopian ideals of Otlet and Wells require a rigid imposition of top-down control over what the “true” information actually is, whereas Bush, despite his government position during an era marked by the freezing over of relations between the United States and the Soviet Union, disregards this entire question in favour of focussing upon the practicalities of creating a workable technology for the individual user. ascertain what role their ideas, in both a conceptual and technical sense, influenced the development of the Internet and its associated technology and infrastructure in reality, and whether their importance in this respect in relation to one another has changed as the Internet itself has evolved, such as the recent transition from “Web 1.0” to “Web 2.0” and debates over issues including the Semantic Web and its ownership. The dissertation will consist of an extended literature review conducted through desk research; in other words, I will be living in the British Library for most of this summer! 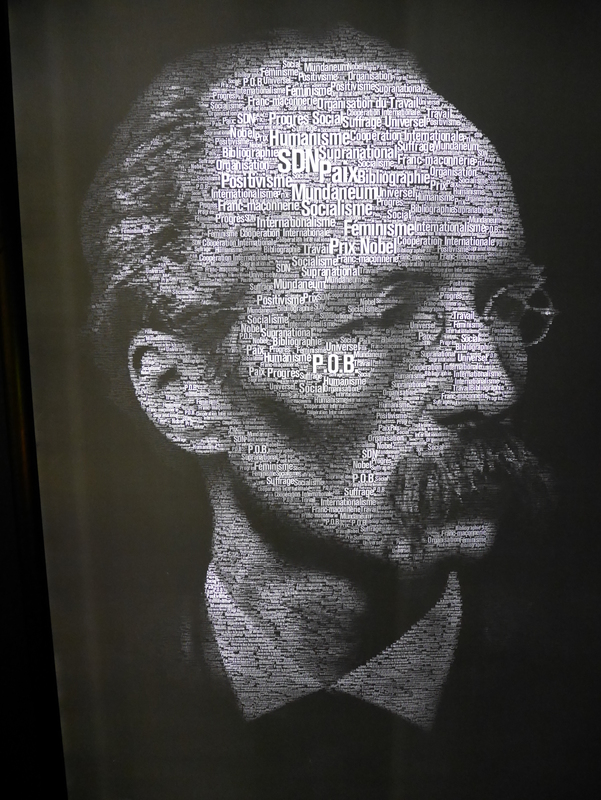 I also hope to visit the Mundaneum itself, now a museum in Mons dedicated to preserving Otlet’s legacy. All in all, I’m looking forward to starting this project, conducting a sizeable amount of original research and producing a valid piece of academic scholarship at the end of it. As I also need to find a full-time job and a new place to live by the end of summer, it should prove to be a hectic, although I hope enjoyable, few months. To complement my previous post on studying the MSc in Library Science at City University London, this entry consists of a listing of posts I made that were relevant to the taught part of the course. The majority of these were written for two of the eight modules—Digital Information Technologies & Architectures and Libraries & Publishing in an Information Society, tagged with “DITA” and “LAPIS” respectively—but some others were independent of either. I hope that this will give readers of this blog a flavour of some of the topics that I covered during this period. It From Bit: information theory—information as a fundamental building-block of the universe; how it is preserved and self-replicates. Ebony and ivory, in perfect harmony on my computer screen: blog design, colour theory and how it relates to website design and user experience, comparison of library OPAC designs. Clash of the titans: information retrieval using structured and unstructured queries in search engines; comparison of Google and Bing. Walking in a multimedia wonderland: Application Programming Interfaces (APIs) used to embed content and to create “mash-up” services; how they are supported on WordPress through shortcodes. A Demon of the Second Kind: Stanisław Lem’s take on information theory: Information theory again—the longstanding problem of Maxwell’s Demon and how it is treated humorously by the Polish science-fiction author. 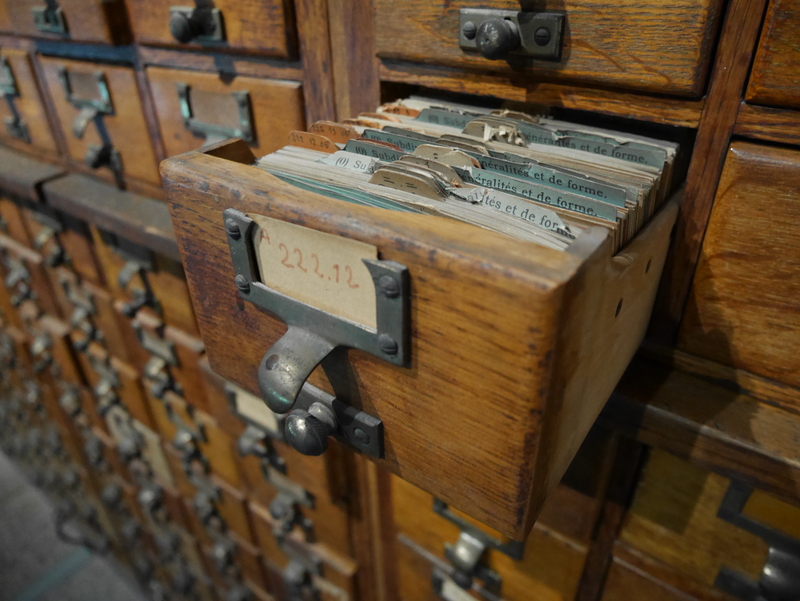 Library metadata standards in the Web 2.0 era: Metadata—its purposes, history and need for further development in the Digital Age. Mapping the Twitterverse: using the TAGS web application to analyse Twitter metadata by visualising the connections between users. 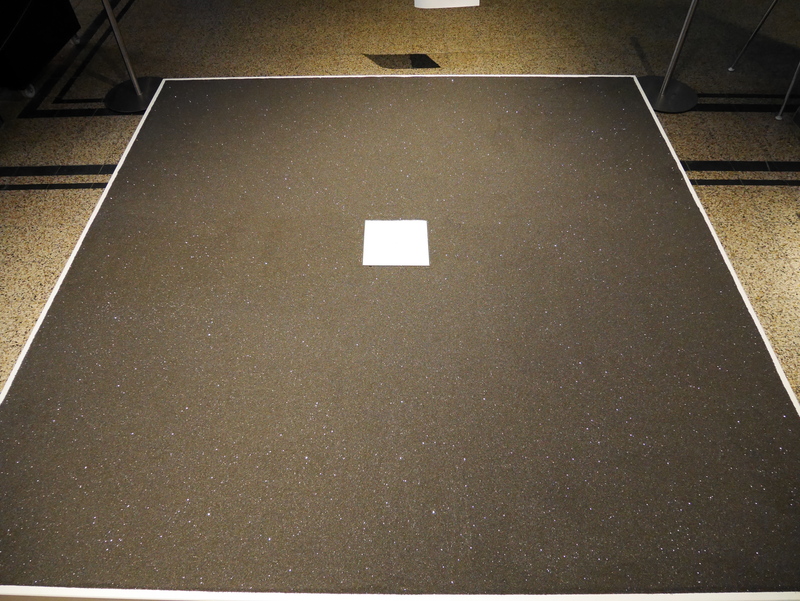 The history of information on display: an illustrated visit to the Science Museum’s new Information Age gallery. Altmetrics in academia: the recent emergence of altmetrics to complement traditional citation metrics; the effect of this upon scholarly communication practices. Screwing around with text analysis: the rise of text analysis and the wider disciplinary study of Digital Humanities. At the coalface of information: a number of examples of contemporary academic projects that use text analysis and data mining. Moving towards a Web of Meaning: the use of text encoding to create a Semantic Web; more examples of webpages that already do so to support data mining. Self-reflection through DITA data analysis: applying many of the techniques and technologies discussed in the preceding posts to analyse my own social media “impact”. The artist in a hostile world: an artist’s role within an information society and the attendant pressures that may be applied upon him or her. The medium is the message, and the medium is changing: why information changes according to the form of media in which it is transmitted. What is an author, what is an audience, and can they be one and the same? : philosophical discussion on the changing nature and purpose of the author, his or her intellectual work, and its audience. Getting creative with copyright: history of copyright and piracy, and the recent development of Creative Commons licensing as an alternative to the existing paradigm. Crisis? What crisis? : the ever-increasing amount and cost of scholarly information, leading to the current “serials crisis” and a need for alternative publishing models. An introduction to classification: outline of the Dewey Decimal Classification and Library of Congress Classification systems. Opening up access: introducing the Open Access movement in contemporary academic publishing. Evolve or die: how recent technological and societal changes have influenced current practice within the publishing industry. Reductio ad Wikipedia? : the changing nature of the encyclopaedia and general reference works throughout history, from the Summa Theologica to Wikipedia. A library in a box: report on a panel discussion held at the Institut Français about the IdeasBox, a charitable project that aims to provide books and digital infrastructures to disadvantages communities. If you go down to the library today, you’re in for a big surprise: how libraries themselves are evolving due to the changing nature of their resources; how their societal roles and use of their physical spaces is being repurposed. The final chapter: more perspectives on new publishing formats and the difference between print and e-books. This post was originally published here as part of the “Student Perspectives” series of the City University London Library and Information Science blog. I began the MSc in Library Science at City University London in September 2014 and, as a full-time student, am currently nearing the end of my studies, with only the small matter of the dissertation left to write. I started my library career in late 2012—after a couple of years of wondering what, exactly, to do with a first degree in History—working first as a volunteer and then as an Library Assistant at Durham University Library, and latterly as a Trainee Cataloguer at Coutts Information Services. After committing to the course at City, I was fortunate enough to secure a part-time Service Assistant job in the university library, which has proved to be very convenient and beneficial for my studies. I can echo the comments of previous contributors to this series of blog posts by agreeing that the course has given me a great deal of new knowledge about the subject, whilst placing aspects with which I was already familiar in a strong overall conceptual framework. I have particularly enjoyed some of the more theoretical aspects of the course, which (superficially at least) have little connection to the practice of library work, such as information philosophy and theory. On the other hand, modules covering digital libraries, computer programming languages, Digital Humanities research techniques and Open Access publishing ensure that we have knowledge of the key contemporary issues facing the profession. Another aspect of the course that I have enjoyed is the camaraderie between the students, including those studying the similar Information Science MSc (not to mention the teaching staff!). Previously sceptical about the value of social media, I was required to create a Twitter account and this personal blog, and I like to think that I have embraced them with the zeal of the convert. Both of these Internet platforms have proved to been invaluable tools for us to communicate with one another and to share articles, links and events that may be of interest, whilst the practice of reflecting on my thoughts and putting them into words on a weekly basis for some of the courses has, I believe, improved my writing skills considerably. Finally, in addition to lectures by module leaders, the course also benefits from a wide variety of guest speakers. Some of these are specialists in a particular subject area; others have represented a particular institution’s experience with an aspect of the course that we have first discussed in general or theoretical terms, again helping to link the theory and practice of librarianship with one another, and in many cases to inspire topics for dissertations. All in all, I have thoroughly enjoyed my experience of the course so far, and would recommend it without hesitation to anyone considering a career as a librarian or a similar information professional. For our tenth and final LAPIS lecture of term (the day also marked our final lecture of the taught part of the course – it’s gone by very fast! ), we were visited by Alastair Horne, the Social Media and Communities Manager for Cambridge University Press ELT. His guest lecture was the most open and free-form of all, as we were encouraged to answer questions that he posed to us on many diverse subjects relating to current publishing models and reading practices. Essentially, the purpose of the questions was to get us thinking about the essential differences between print and electronic books. In the last few years, e-readership has soared: in August 2012, Amazon.co.uk announced that its sales of e-books had surpassed those in print format; a recent Nielsen BookScan report indicated that sales of print adult fiction have fallen by £150 million from 2009 to 2014; and the U.S.-based Pew Research Center has recorded a steady and sustained rise in the ownership of e-readers and tablet computers. However, more recent developments have suggested something of a reversal, as sales of e-readers instead have begun to slow. This can partly be explained by the market starting to become saturated—those people who already own a device are unlikely to buy a new one for several years—but also by the intangible benefits offered by print books. This was illustrated by a brainstorming exercise that we undertook during the lecture: we were asked to produce a list of advantages of e-books over print books, and another one vice versa. We were able to come up with a whole series of advantages for e-books—for example: portability, search functionality, linking to the Internet, multimedia content—whereas for print books the advantages were difficult to define, instead focussing on the overall experience of reading a physical book: the tactility, the feeling of tangible physical ownership and of using a “real” object. It is true to say that most e-books are simply electronic versions of the printed text, and that “enhanced” e-books—offering additional, multimedia content—have as yet failed to have much impact on reading habits; perhaps this will change as the underlying technology continues to improve, and the first generation of children who have grown up with e-books and ubiquitous portable computers—perhaps with radically different reading habits compared with those of us who are firmly grounded in the print paradigm—become adult consumers. In all, I can say that LAPIS was an extremely interesting module which covered all aspects of libraries and publishing—from general philosophical questions on the nature of authorship through to the technicalities of how current publishing models, such as Open Access, work—and also featured an impressive selection of guest speakers who provided a diverse range of experiences and opinions on the subject. My posts will probably become less frequent from now on, but I intend to keep the blog going with some musings on my dissertation topic over the summer (which will help to preserve my sanity, if nothing else!). I hope that you have enjoyed reading so far! The programme is not just intended for areas in developing countries that are affected by humanitarian catastrophes, but also for disadvantaged populations in “developed” countries: it has been used, or its us is currently being evaluated, for the benefit of Aboriginal communities in Australia, deprived urban communities in New York, and migrant settlements in Calais, in addition to the more “obvious” areas of conflict and unrest in Africa and the Middle East. This point, and the positive effects of reading, literacy and libraries in general, were emphasised by Barbara Band, the former head of CILIP, who quoted the results of some recent alarming surveys carried out in Britain: 3 in 10 British children do not own a single book of their own (2011) and a third of the poorest British children do not have internet access at home (2013) Reflecting on this figures, my mind wandered to the example of the Finnish government-provided maternity box that is given to all mothers: could an “information literacy box” be given to each new schoolchild one day in a partnership between the government and a specialist charitable scheme such as the IdeasBox, which already co-operates with governments, publishers, other charities and so forth? I was also impressed by the cross-fertilisation of ideas that took place during the evening. For example, the author Ian McEwan proposed a tie-up with the Solar Aid initiative that he already supports, as books by themselves are of limited value if there is no light by which to read them. A member of the audience from Penguin Random House UK also offered her company’s support in the question-and-answer session that took place after the discussion. To me, this provided timely hard evidence of the rhetoric that allowing networked access can improve the lives of disadvantaged communities by demonstrating the value of utilising multiple perspectives and areas of expertise at a social event. Several panelists pointed out that the freedom of information, expression and thought is under pressure in a number of countries throughout the world for political and religious reasons, and that this project represents the ideal riposte to this trend. This links back to the debates that we have discussed in my LAPIS module on the cost of knowledge and the digital divide that this, and other costs associated with the development of technology and infrastructure, produces between developed and developing countries. On the one hand, it is somewhat depressing to think that these economic pressures are therefore added to by the anti-information tendencies caused by political authoritarianism and religious extremism, but also encouraging that a successful project such as this has been set up to counter it. All in all, it was an extremely informative evening, and I will follow the progress of the IdeasBox programme with much interest.